Prior to 2006 the Faculty of Teacher Training and Education Unpas had an accredited "Metalogical" Educational Journal, but in 2006 it decreased the accreditation rating from accredited to unaccredited. Since 2006, the lecturer of Mathematics Education Program still has difficulties to publish the results of substantial ideas and research results that have been done by the institution itself. Therefore, in 2011 Prodi Mathematics Education together with the existing study program in the environment FKIP Unpas proposed ISSN to LIPI for the publication of the journal, with the name of the journal Mathematics Education " Symmetry " with ISSN print number 2086-4917. The publication of this journal in order to implement one of the missions of mathematics education program is "to implement and publish the results of research and community service in mathematics education by applying innovative and innovative information technology and national and international level". With this journal there is no more reason for the lecturers or researchers in the environment Education Prodi Mathematics who experienced kselitan to publish through the journal. However, it is also unfavorable if the writer comes more from within the institution, the better is if the proportion of the writer from the outside is more than half of it. Initially the author of the journal " Symmetry " is more derived from within the institution. This is understandable, because this journal is not known to people. Initially the editorial team is still having trouble finding the author in the journal Symmetry , especially those from outside the institution. Finally the first publication of the journal " Symmetry " took place in February 2012, with a proportion of outside authors more than in the institution. After a year's run, Symmetry's journal has a significant development seen from enthusiasts who include articles that are published, because many have known the journal Symmetry . With the journal Symmetry Prodi Mathematics Education FKIP Unpas, more and more known people. Until early 2015 journal writers are still increasing, both from within the institution and from outside the institution. By 2015 the editorial team has prepared a proposal to submit this journal to be accredited, but has not had time to apply for accreditation, as the development of communication technology and print journal information is not desirable anymore, because it is difficult to be accessed by the international world, it must be replaced with journal on line . The need for online journals that have e-ISSN numbers is something urgent since April 2016, so offline journals should be abandoned soon. This is what prompted the Prodi Mathematics Education FKIP Unpas, to immediately update the journal " Symmetry " which has been published 7 times. However, because the journal on line must have a sub name of the journal, then we give his name to the name of the journal sub Pasundan Journal of Research in Mathematics Learning and Education . 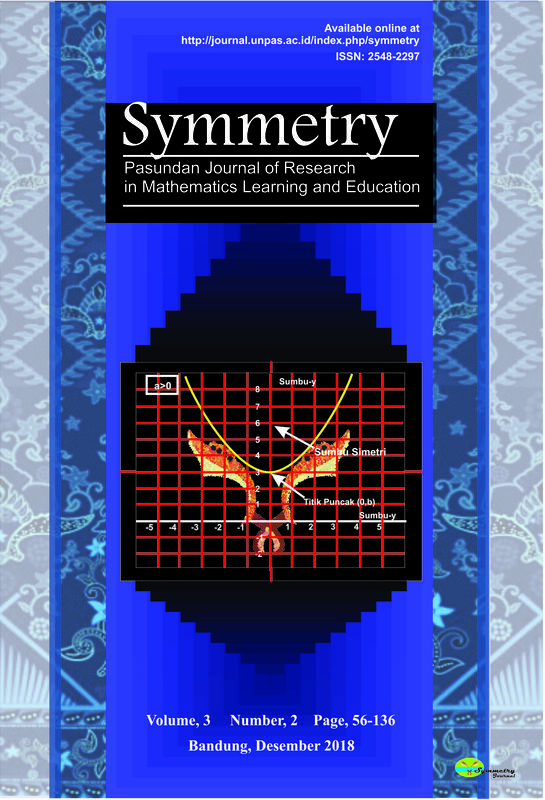 Symmetry: The Pasundan Journal of Research in Mathematics Learning and Education has a vision of "Becoming an internationally renowned Mathematics Education Journal Community" in line with the vision of Unpas, Faculty, and Mathematics Education Program. This journal is reviewed by best partner with the doble blind method.